How does dredging the Salado River impact Buenos Aires? Recent history has proven that a tremendous amount of rainfall in the low-lying region has caused the Salado river to repeatedly flood threatening the agriculture community. Until recently the river had not been properly maintained. This has caused prior floods to occur. Recent funding now makes it possible to pay for improvements to the river and surrounding areas and having access to the proper dredging equipment that will help control potential floods by restoring the river to its natural state. From 2000 to 2017, more than 800,000 acres of land were damaged throughout Buenos Aires, Argentina, as a result of the Salado River basin flooding. The city of Buenos Aires is the capital of Argentina and the country’s largest city. The thriving community is located in the province of Buenos Aires, by the Rio de la Plata estuary. What many outsiders may not know is that the Buenos Aires province is a large agricultural community. Approximately 20% of Argentina’s grain and meat products come from the region and are considered extremely important to the nation’s economy. Most of the land in the province is very rich in nutrients, but it is also very flat and vulnerable to extreme weather conditions that have resulted in reoccurring droughts and flooding. There are several smaller streams, estuaries, and rivers located around Buenos Aires. Over the last 40 years, the average rainfall in Buenos Aires has increased by 20%. The additional rain has caused the Salado River to flood. Locations that border a river such as the Salado River are prone to flooding during rainy periods of weather. Over several years, the Salado River has collected a variety of materials as a result of heavy rainfall, accumulating a large volume of sedimentation and silt. When a river is not adequately maintained, debris will gather over time, causing the river to bottleneck. This action restricts the rivers ability to provide naturally flowing water and causing water levels to rise, triggering a flood. For several years, community leaders and politicians have discussed various dredging ideas and solutions such as widening the river and digging a deeper channel in the hopes of reducing potential flooding but had been unable to raise the necessary funding needed to cover the cost of such a massive river-dredging project until recently. In April of 2017, the World Bank approved a $300 million loan for the flood prevention project. Over the last 18 months, many dredging contractors have spent significant time working to improve flood conditions in the area. So far contractors have removed over 5.23 million yd³ (4 million m³) of sand and sediment from the Salado River using a series of dredges. 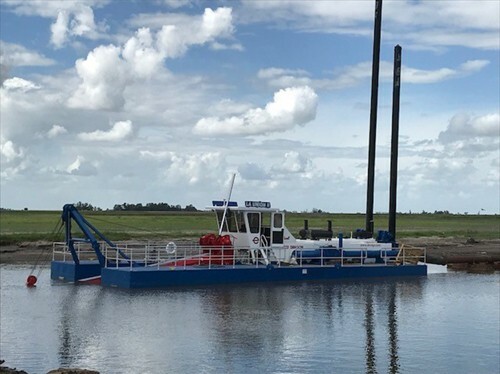 To help control flooding in the local region, dredging crews from Helport and Chediack (UTE) have opted to use two Ellicott Series 1270 Dragon® cutter suction dredges that are ideal for this type of river dredging application. The 1270 Dragon® dredge is capable of reaching dredging depths of up to 50’ (15 m). Also, this medium-sized dredge contains an 18” pump and is equipped with two separate diesel engines, one of which is dedicated to the dredge pump for optimal production. Perhaps the biggest challenge facing crews working on the project includes limited access to dirt roads when it rains as the roads flood making it difficult to reach the area where the dredging takes place. Accessing the riverbanks in the surrounding environment has also proven quite difficult to enter and is extremely limited. However, despite these physical obstacles, the Ellicott Dragon® dredges are relatively easy to disassemble and reassemble allowing crews to dredge in hard-to-reach locations along the river. In circumstances such as these it is very important to have a reliable dredge that is capable of overcoming these difficult challenges. 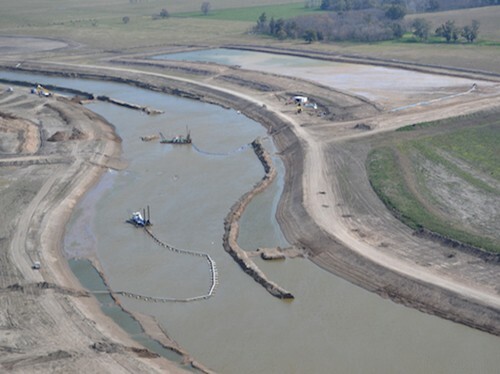 While dredging the Salado River does not guarantee future flooding will not occur, it is one of the most impactful approaches to minimize or curtail future flooding. Once the river is restored to a more natural state through the removal of excess sediment, the water current will flow along its natural pathway at a steadier pace. In addition, the sand is collected from the river dredging efforts will then be repurposed and used to improve the lowlands, enhancing the terrain elevation, thus also helping to reduce the odds of reoccurring floods in the low-lying communities. As the industry leader of quality-built dredges since 1885, Ellicott has an unparalleled history of Innovation, Production and Reliability. As an industry leader of quality-built dredges since 1885, Ellicott has an unparalleled history of innovation, production, and reliability. Ever Imagine What It Takes to Build A Dredge?